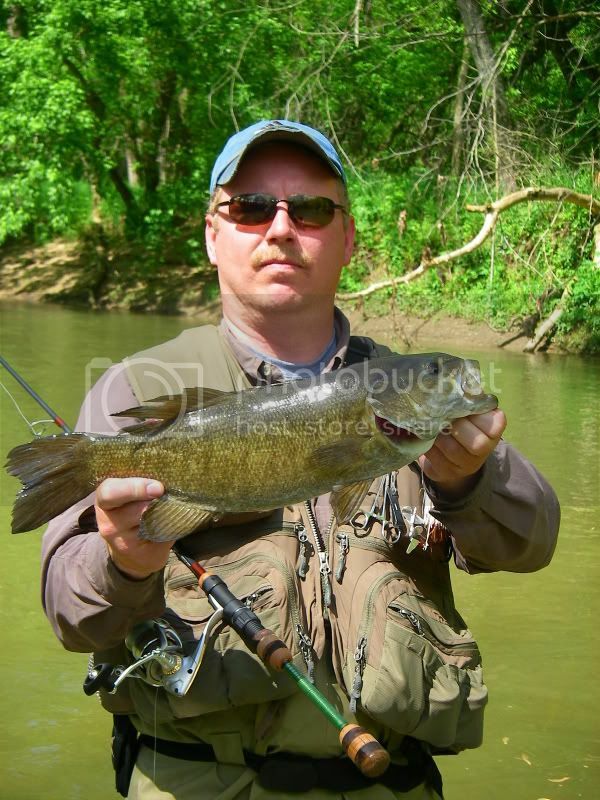 At the root of it, my smallmouth fishing is the quest for satisfaction. Sometimes it's hard to quantify what is so magnificent about wading a stream. For me, it starts with waking up with the hope something new and exciting will happen. Each time out is a script yet to be written. How will it turn out? Today was one of those days where Mother Nature gave us a peek at how things might work. Neither Mike or I had any idea what was to come. The unknown potential craziness, the camaraderie, the sport. We got to a high flowing stream by about 10am, the water was cool (55F) and surprisingly clear considering the rains most of Indiana has gotten. For a few moments, we contemplated driving as far North as the Yellow or Pigeon for a chance at SMB. We sobered up and vowed to try those some other time. Mike was jonesing for some topwater fish. I didn't think we'd find any because I feared the water would be muddy. It wasn't bad, and at points got downright clear. Some stain and vis to 18". First fish was a 16.5"er on a fluke who hit next to some pretty fast current within minutes. We moved up and got some light taps. The surface had helicopters and those annoying maple strings that fouled both trebles and spinning blades. Picked up a couple more on flukes. 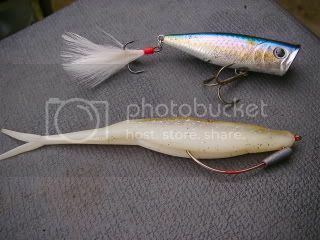 I was trying out some weighted EWG stickbait hooks on the flukes bought at Wallyworld. They worked great :) . We got to an above riffle area with a slower side to both sides created by a choke point. The right side had depth and a couple of great looking lay downs parallel to the current. Mike caught a fish on his fluke. I got one on Sammy then a couple misses I switched to a LC G-Splash Popper. Working the popper with only an occasional 'bloop' fish started drawing up out of the depth and wood. In no time, I had three more Bass to 14". Mike switched to the same lure and we were dueling. I thought really hard about working the G-Splash upstream along the opposite bank (slight undercut bank), but my waders were folded down at my waist. The water there looked too deep and there was no casting angle. 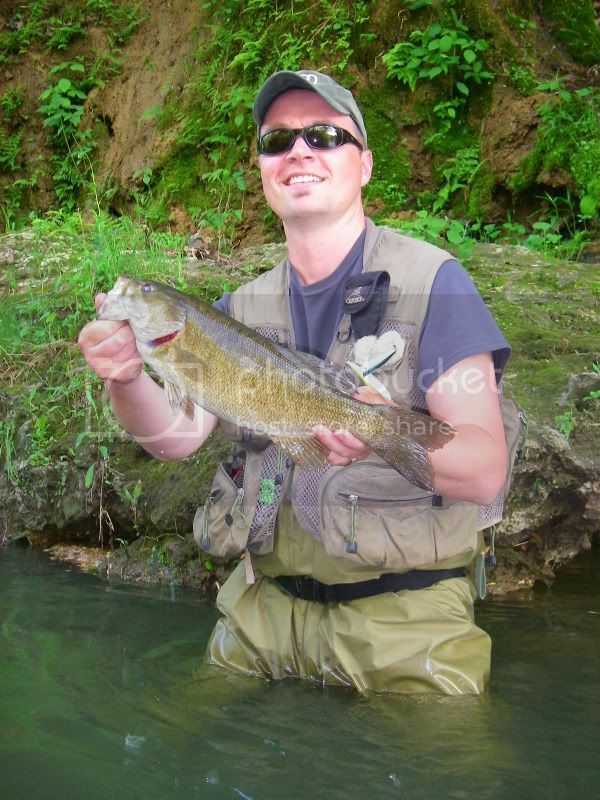 I told Mike cast parallel to the bank in close and bring it right upstream towards you. Mike tossed the perfect cast into the area and started to work it upstream, almost too fast. CLUNK. It wasn't too fast. 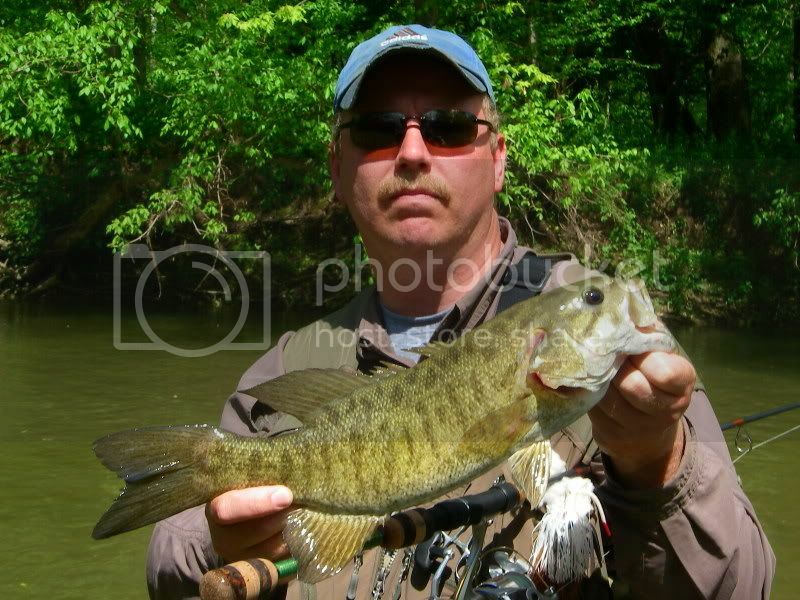 It was immediately apparent he had hooked a large Smallmouth Bass. Mike kept great pressure on the bass, but we were both worried it would cut loose since it was now in the some pretty fast current. As Mike reeled this behemoth in, I scooped it's belly and lipped it. I was pumped. I know Mike was. We snapped a couple pics and released her. Apparanetly, she had NOT spawned yet. Fellas, this fish was fat and long :o :o . So happy and pumped to see Mike catch a whopper. We high fived like 3 times. Awesome. After leaving that spot, we worked deliberately with most of the normal lures. 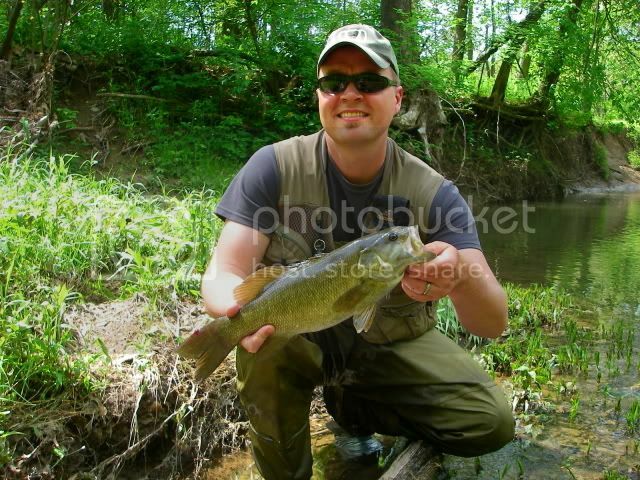 It became apparent the bass were in slower areas and wanted something somewhat helpless- crippled. We went 2-3 hours in the noonday sun without a bite. We caught a few more on flukes, Sammy, popper. I got a 17.5" on fluke at some slack push water. Fish had an open bleeding sore on its tail and had been mangled by whoever caught it last. BT catches a fish on a fluke, and I throw on my G-Splash as Mike throws in again. "Let it sit" BLUNK! 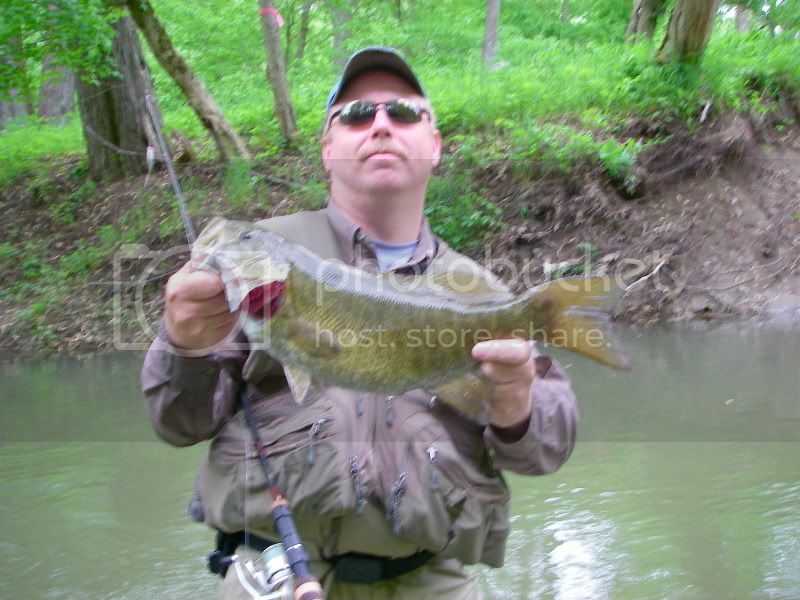 Another crazy big Smallie for MC Hammer, lipped and measured to the mm, it just broke 20"! 2! I could swear that this was the fish that had followed the other in. I got a fish short of 16" and Mike another. We moved on, I picked up fish here and there on the fluke getting a decent numbers day. We kept looking for more post spawn highwater staging areas. Now it was a long day. The bass seemed scattered, when we found them, they were grouped. In between- not much. I used the fluke as a search lure for most of the day, this paid off nicely on decent numbers. Mike is on Cloud 9. Call him up and hear the story. We had a blast! We'd both been pretty happy with one 18" fish. 5/30/08 Wade and 5/31/08 Float- Semi Stinky. How many times will I fall in the river? 5/10/08- Post Spawn Buzzbait Madness!